This is the first month I've ever participated in the monthly Papertrey Ink Blog Hop. I've lurked and lurked, but I always felt like I never had the "right" stamp or idea. But the point of the Blog Hop is to motivate you to try something different and to get to know some of the other PTInkers out there (both of which are great ideas), so here goes nothing:) This month, the challenge is based on this inspirational image rather than a theme. After cutting the leaves, I had some extra gradient paper that I didn't want to waste. 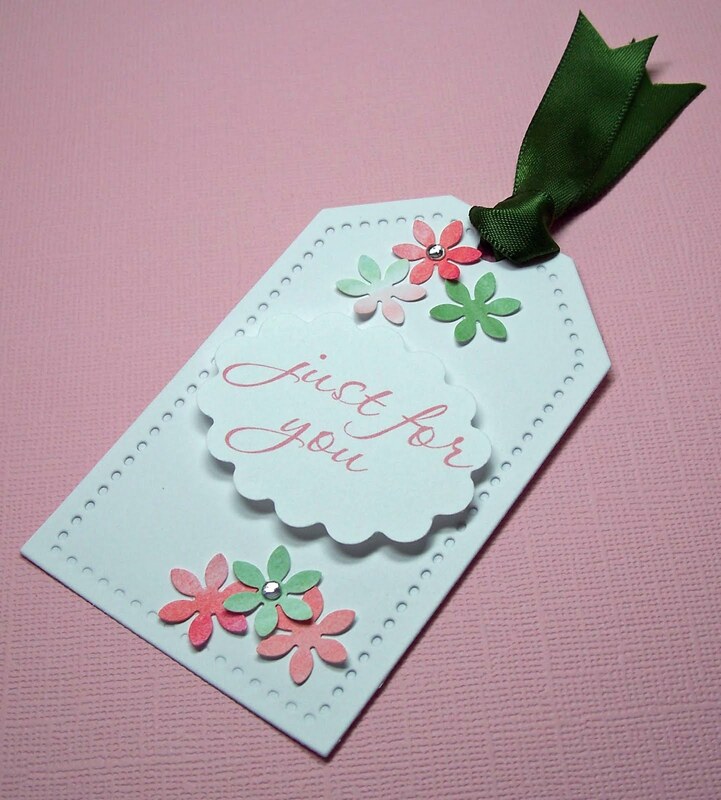 So made a few more flowers for a coordinating gift tag. I didn't have a stamp to match, so I made a custom sentiment. This set is for an almost teen girl, so I tried to keep it young and fresh, but not childish. I also did a quick gradient card this morning with watercolors. I whitewashed the over the watercolors for a softer look. This is the only picture that I could get to work, but you get the idea (in person, the colors are a lot more muted and that's hard to photograph). I'm looking forward to seeing what all the other PTI Blog Hoppers have created. Thanks for looking and happy hopping! Awesome cards and tag! I'm not sure I can do the gradient thing with Copics....I'm just learning to color and shade with them. Wow, your cards are really cool! You really nailed the challenge colors, and I love the touch of tulle on the bottom card! Both cards are very pretty!! Copics are LOTS of fun once you get past the intimidation -- just keep PLAYING with them, you'll learn all of the answers soon enough :). 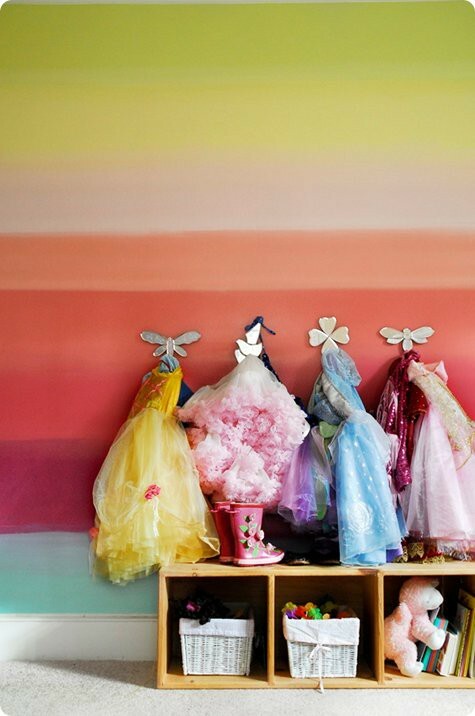 Just gorgeous...I've been seeing lots of tulle on people's designs...love it! So soft and delicate, love the gradiant colors on the leaves! Beautiful card & tag - love the pinks & greens! And love the shot of the gradient water color card, too. Copics - check out Suzanne Dean's website and Marianne Walker's - lots of tutorials & tips. Just takes practice. Copics scare me because of the huge outlay for something that takes a long time to master. I love cheap, instant gratification :) Still, one day I want to get brave & make the plunge too. I really like the clever way you used the diecut to highlight the stripes - they stand out so well against the white space. And your watercolour gradient card is lovely! I want to give that a try - especially with the lighter colours. My gradient cards always end up very dark. I especially love the last card: the watercolor wash and the gathered tulle at the bottom are fantastic! 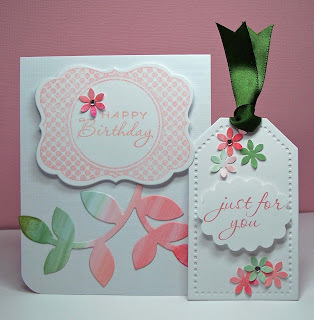 Beautiful cards and tag! 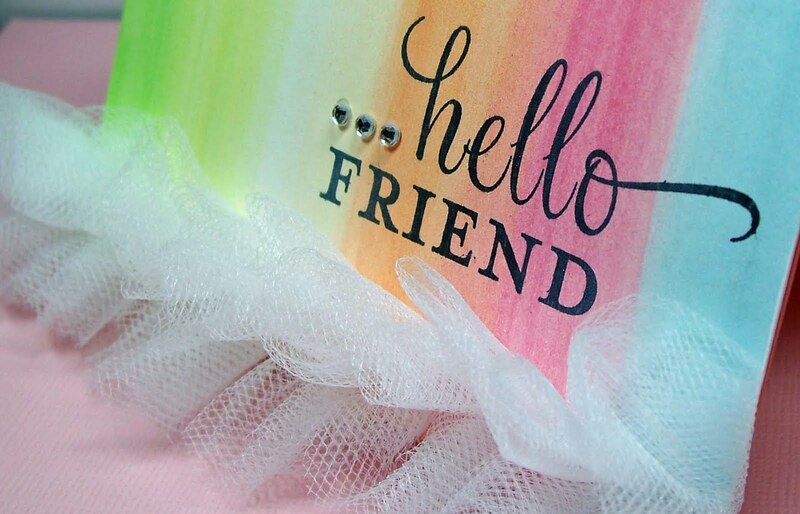 I love the rainbow effect on the leaves on the first card and the tulle at the bottom of your second card!